8 volumes in total but never finished, years 1746 - 1748 not covered. A question rising when I read this book. Information there: British batallions had wooden ramrods. Bn.s were 360-800 men strong. How would you field the british bn.s? 360 men would mean 3-4 bases in my system, while 800 should be 6-7 bases. I would run with the averages - if you look at a field strength of 5/600 then you won't go far amiss. Just to update the quote from 'thomasmante' there are nine volumes, it's just that the final volume has never been made available online through agencies such as archive.org or googlebooks. Same would seem to go for a number of other series such as "The Campaigns of Prince Eugen", which - I believe - comes out at a whacking 21 volumes. damnitz, just had two quick thoughts on the question of unit sizes/troop numbers - Am still devouring Keith's rules, so apologies if this next doesn't quite fit, but unless you are wanting to create a specific moment i.e. Duroure's regiment after Fontenoy would be at half strength (so definitely a 'small' unit) you couldn't keep track of all the troop numbers as these would change on a daily basis. Would it therefore not be better to use the regimental sub-units as a rule of thumb? For example a British battalion has 10 companies, with two companies to a base that would be five bases. If you wanted it to represent a full strength unit you could add a base, or take one away to represent one that had particularly suffered casualties....This would fit also with the Austrian practice of operating by 'division' - and this incidentally answers your question on the Austrian dragoons at Fontenoy, it's a detachment of the regiment that is present, not the whole regiment. Just a thought. Ref your question on OOB's I think it comes down to the author - My biggest critique on the book by Denis Gandilhon is that the French OOB is listed with great detail whilst the Allied OOB is in it's most basic form. 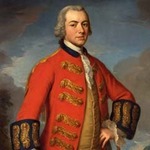 Having read with interest 'Roi's posts on Ramillies a similar criticism was thrown at me by Jeff Berry, author of the 'Obscure Battles' Blog that 'Roi' quotes - As a close friend of mine once said, you put your head over the parapet and you get shot at. In his blog Mr Berry comments on the fact that I didn't cite the sources for the OOBs or include battalion strengths (although for a different battle he notes that the author does the same but says that is ok....odd that). The lists were produced by a close friend of mine who has spent the last two decades studying Marlborough's campaigns and digging through the Public Records Office at Kew, the Chateau de Vincennes etc etc. The reason the battalion numbers don't appear was a personal decision: Osprey's are written on a strict word count and over 200 times "....officers and men" equates to a full page of extra text. The decision was to therefore provide the text or include the numbers, I chose the former. I found Mr Berry's blog interesting, and would assume - and I could be wrong in this - that he used google for his maps. In both Ramillies and the forthcoming Fontenoy we used the modern Belgian OS maps, overlaid with the Ferraris maps of the Austrian Netherlands from 1770/77 (you can see these online on the NGI website which enabled us to put reasonably accurate maps/BEVs together* and I would recommend these to anyone interested in the WSS/WAS in this theatre - The maps certainly provide an insight as to how the attacks were funneled by local geography. @ Roi, ref the waterways at Ramllies whilst I agree with Mr Berry that they aren't the Mississippi, I know one re-enactor who fell into the Fagneton in heavy rain (and naturally how many of his colleagues were needed to pull him out) and to satisy my research on the battle I took a running jump at each of the three watercourses (on the day after a rainstorm) and with the waterlogged ground, none were particularly easy to negotiate. Add to that having several thousand men pushing you from behind as they have orders to advance and you can see that unit cohesion would go to pot. The slopes on the waterways aren't particularly steep nowadays (and from the maps I've studied were seemingly not much different then), but the problem is created by the proximity of formed enemy troops on one hand and the fact that the troops who have just made their way across the stream are being forced to reform in a very constricted area, with their supporting units continuing to push forward...It does become a mess. That means that you would say that hanoverian units were larger than british? I followed the numbers I found in different books. I will write a review of your book when I had read it. I think that a Review is always a very personal Thing sometimes even depending on your humor you have at the moment. For tt you don't need exactly the size of units if they are right if you compare them. I think, that GL Howard was the commander of the 3rd line. A interesting character. I found the information that the dutch cavalry fought with distinction at Rocoux*. Maybe the conduct at Lauffeldt was caused by some irritation. Fabulous work Damnitz, I salute you sir! Having now filled my boots with Prussians, Austrians, French, British and Reichsarmee its time for the WAS.....Dutch! Any views on them? I would have thought the normal Dutch line infantry to be not very good, with the Foreign and Guard regiments as better. cavalry and artillery I have no idea. Any or help greatly appreciated. thanks all. ....ah....just seen your excellent work. thank you again! Whats the evidence for superior fire for the Dutch? Lineinfantry (6 Bases) – standard – superior for fire only"
Gandilhon mentioned that the dutch drill was much the same like the british. We had no battle with the dutch yet. Therefore I don't have any ideas if it feels right. I think that the dutch are sometimes ranged too weak. Their Outing at Fontenoy was maybe not the best, but they fought better at Rocoux and Lauffeld - except their cavalry. After our large Dettingen-refight I assume that we will not play WAS untill next spring. When I was looking into musketry fire systems for my threads on the matter it was most likely that the Dutch introduced early platoon fire for the WSS and that they also began the trend towards both marching fire and fast fire that the Prussians adopted and perfected. So perhaps the British drill was much the same as the Dutch! The WSS drained Dutch resources and lead to a major reduction in the strength of their army; that doesn't necessarily mean that their battlefield efficiency was reduced. Be kind to the Dutch, there's not many of them! Maybe a very good looking army, but how difficult it was to command such an army on the field of battle? Excellent link Damnitz - thanks. An excellent link, indeed and concurs with other sources I've read. This thread is full of valuable information, I'm thankful to all contributors! So, how would I field French line infantry battalions? I presume that by average I should field them as small.